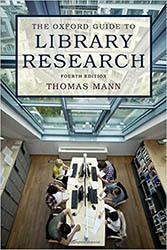 Thomas Mann spent more than 30 years as a reference librarian at the Library of Congress, acquiring unparalleled skills in helping researchers discover new connections, pathways and higher-quality resources. The latest edition (May 2015) of his Oxford Guide to Library Research is the best overview of major research resources, both print and electronic, that are not freely accessible on the web, but which are still freely available through real libraries. Paratext’s Reference Universe 1975-2016 (pp. 2-11);19th Century Masterfile 1106-1930 (pp. 120-122) and U.S. Documents Masterfile 1774-2016 (pp. 266-267) are treated thoroughly as well. Paratext enthusiastically recommends the new Oxford Guide to all bibliographers, library practitioners, scholars and independent researchers. To see the Oxford Guide's review on other Paratext products, view this summary.